The Sheridan Douglas Tarot was first published by our family in 1972 to accompany the book, The Tarot: the origins, meaning and uses of the cards by Alfred Douglas. 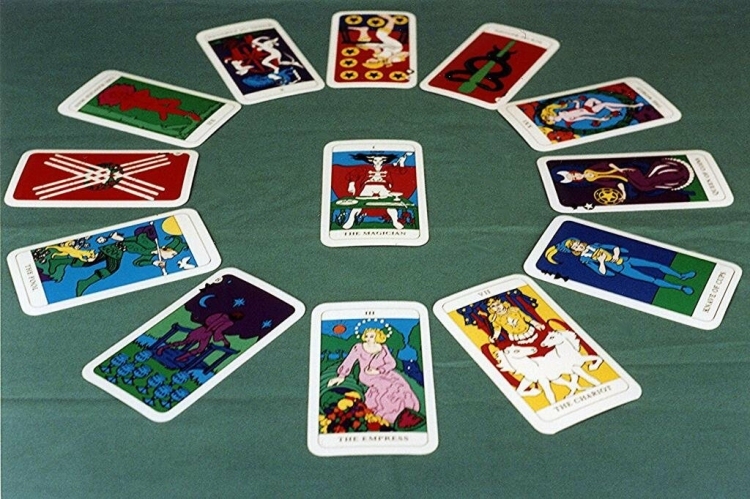 78 Tarot images were created by the artist David Sheridan as black and white drawings illustrating the text of the book, and were then coloured and printed as a deck of cards. Both book and cards emerged over a three year period, 1968 to 1971. The Sheridan Douglas Tarot quickly became sought-after and sold well for a decade. In the early ’80s the deck became unavailable, and its reputation as a “legendary pack” (to quote the words of the proprietor of a celebrated occult bookshop in central London) grew steadily. Today, demand from collectors is such that samples of the original 1970s deck have changed hands for as much as $450. How did this project evolve? Alfred Douglas first became interested in folklore, the European magical tradition, and the writings of C.G. Jung, while at school in the late 1950s. He corresponded with the noted English magician, Madeline Montalban, who had worked with Aleister Crowley in the 1930s. In 1961, while at college, Alfred Douglas was accepted as a student member of Madeline Montalban’s school, a genuine teaching Order in the western magical tradition which had earlier inspired MacGregor Mathers’ Order of the Golden Dawn, Aleister Crowley’s Argenteum Astrum, and Dion Fortune’s Fraternity of the Inner Light. For more about Madeline’s work and how it has continued since her death in 1982, see here. 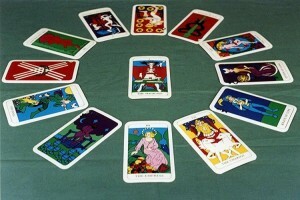 Madeline Montalban’s special area of interest was the Tarot, on which she had written a monthly article for many years in the British journal, Prediction. It was while assisting her in the practical side of running her school in London from 1964 to 1967 that Alfred Douglas pursued his own Tarot studies. He then became the partner of astrologer and writer on the occult, Jo Sheridan, author of classic books such as What Your Hands Reveal, and The Floral Oracle. When he began researching his book on the Tarot in 1968, he realised that a talented artist would be called for to provide the illustrations. 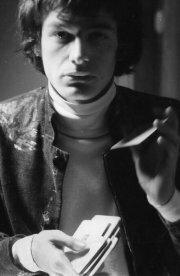 The obvious choice was Jo Sheridan’s young son, David, who as well as being a gifted artist and inventor, shared his mother’s interest in esoteric symbolism. It was decided that the new Tarot cards should be inspired by the earliest European decks in their strong lines and rich, pure colours – echoing medieval stained glass in their power and directness. They should appeal to the depths of the unconscious as well as to the conscious mind, and so help to evoke the powers within. The descriptive imagery of the Minor Arcana cards would be decided by applying the 56 cards to the ten spheres of the Qabalistic Tree of Life, ten cards plus four Court Cards being ascribed to each of the Four Worlds of the Tree. The 22 Major Arcana images would be applied to the 22 paths of initiation linking the 10 spheres. This system of attribution was taught by the Order of the Golden Dawn, and has proved so valuable that it has been reflected in numerous decks since. It is to be found most notably in the famous Rider/Waite deck of 1910. Arthur Edward Waite was an initiate of the Golden Dawn, and with the artist Pamela Coleman Smith, designed his deck to illustrate the Qabalistic scheme. Following its launch in 1972, the Sheridan Douglas deck sold well for the remainder of that decade. It became popular in the United Kingdom, North America, Australia, Japan and other countries. For the new edition, launched in 2006, the original black and white artwork was first transferred to computer, then each of the 78 hand-coloured originals was painstakingly brought back to life. Proofs of the new cards were compared with original decks for accuracy and consistency. Minor errors and omissions found in the original cards – caused by printing limitations over 40 years ago – were corrected. All this was carried out brilliantly by Paul Wilson-Patterson and his team at The Electric Pencil design studio in Fairlight, East Sussex (happily keeping the project in the family – Paul Wilson-Patterson was David Sheridan’s cousin). In February 2007 we followed up the successful launch of the new Sheridan Douglas Tarot deck with the republication of Alfred Douglas’s book, The Tarot: the origins, meaning and uses of the cards.